I built a jetbike model a long time ago (way before my Eldar) and I figured out a way to make a fairly sturdy and cheap magnetic flying bases for my model. Here's what you'll need... an old pen, your flying stand, a small screw, some greenstuff, superglue and a suitable magnet. I grabbed an old pen out of the kitchen drawer and a screw from my workbench. You don't want too big of a screw otherwise it will damage the jetbike when you go to put the whole thing together. As far as magnets go, there are all kinds out there from regular ones to Rare Earth. You just need something strong enough to hold up the jetbike. The one I used here is from Michaels Craft store and it fits perfectly inside the pen tube. Assemble it like so and you're in business. They go together pretty quick and it's more than enough to hold up your average jetbike (even with some metal bits). 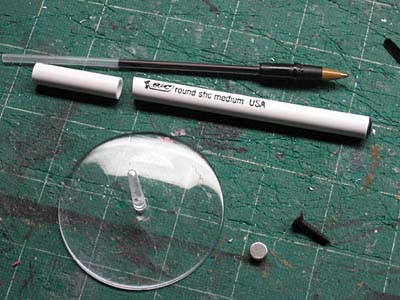 You can paint the pen tube afterwards and leave the bottom of the flying base clear or give it the same treatment as the rest of your army. I hadn't thought of it this way. I do it differently that works fine for me. I simply put one magnet drilled into the jetbike, and glue with epoxy a slightly thicker magnet to the flying base. You can't see the magnet from a tabletop angle and it holds the jetbikes just fine. I also use this for Vypers and Grav tanks (bigger magnets of course). *shudders* I hate flying bases so much. This way seems very smart and useful, thanks Ron! Faolain: I may need to go the epoxy route in the long run but I'm holding out for now. Akozz: One day I'll fold and buy a bunch of magnets. I'm going to hold out for as long as I can though. I'm afraid once I start, there'll be no going back. I had never considered the small screw to adhere to the magnet. That's a fantastic idea, and I'm definitely going to use that for other applications, like sponson swaps. Thanks! Mike: No problem. The idea isn't mine and I don't remember where I first saw it but I know a lot of people use it instead of two magnets. I made some of these for my Tau tanks yesterday. Only instead of a screw I just glued some washers on the underside of the tanks for extra stability. 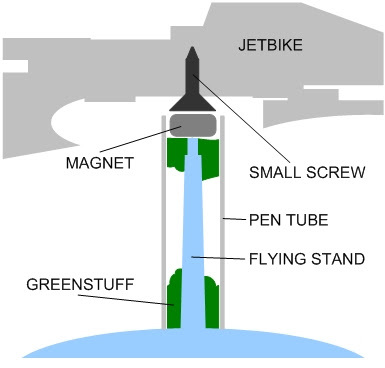 The screws are probably better left for jetbikes. 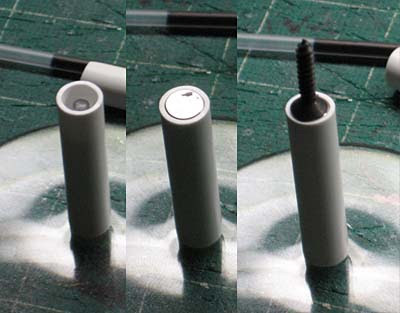 You can also use small nails instead of screws by cutting them to an appropriate length. timdp: Good point. It might be less traumatic on the jetbike as well. The screw can damage the bike if you're not careful. Curious; what size magnet did you use? I've looked at two craft stores and found nothing that would fit the pen tube. Looks like I'll have to order online...just not sure what size to order! Thanks! Philsminions: It's a 1/4 inch magnet I picked up from Michaels craft store. It's a brand-X name and they come a handful in a pack. Groovy...thanks! I have to get three of them put together for my BT Speeders.